Near treeline in Rocky conditions are harsh and punishing. High winds and heavy snows make this transitional zone a place where only the hardy can flourish and endure. 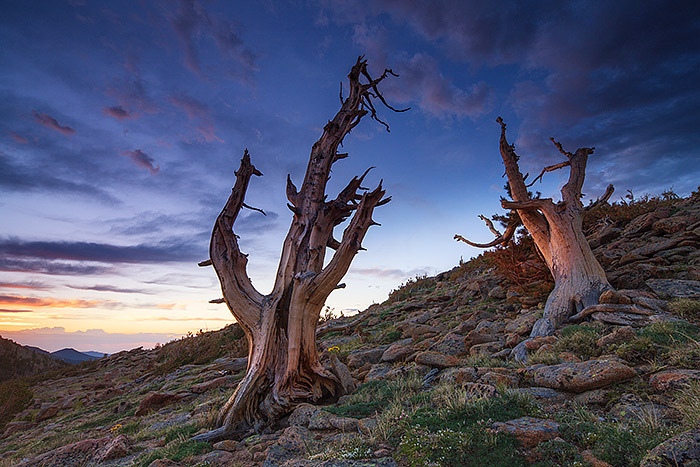 Skeletons of two Krummholz tree's welcome the morning sun on a peaceful morning along Trail Ridge. These tree's endured through these difficult conditions for many years, and their windswept remains are a testement to natures harsh beauty. Photo © copyright by Thomas Mangan.